Card Size (Folded) - 4 7/8" x 3 3/8"
Sheet Measures - 6 3/4" x 4.875"
The Type Set Thank You Cards are perfect for sending to a guest who recently attended a special event of yours. These Thank You Note Cards express gratitude with a uniquely designed cover featuring the phrase "Thank You" in multiple languages! 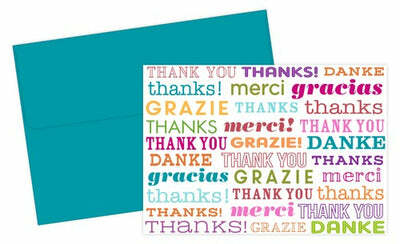 Our Thank You Cards measure 4.875" x 3.375" and come pre-folded and are packaged in an acetate box. The thank you cards are made from 65lb Cover.